Here in Houston we’ve been seeing temperatures well over 100 degrees, and all that heat is being absorbed into the roads that we drive on. 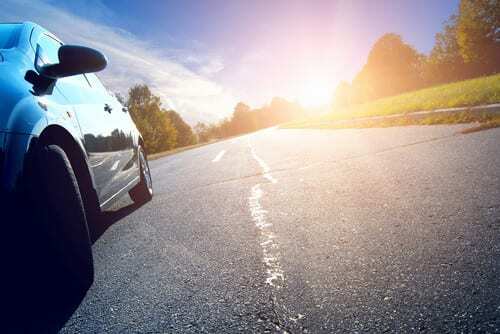 In the summer, your tires need to be in top shape in order to endure the sweltering temperatures. Here are some helpful things to keep in mind when shopping for and maintaining your vehicle’s tires during the hot months of summer. The term “all-season tires” is somewhat misleading. It was coined in the 1970s when Goodyear advertised their Tiempo line with the tagline “for all seasons, for all year” (we can still hear the jingle). However, the term does not mean that an all-season tire is the best for all seasons, but rather, a compromise that is acceptable, though not optimal, for each season of the year. All-season tires work in both winter and summer weather, but not as well as tires designed specifically for snow or for summer. Whether or not you need summer tires depends more on the type of driving you do, not the temperatures you’ll be driving in. For example, driving on difficult roads that require a good grip is safer with dedicated summer tires. These tires feature very soft tread compounds that don’t flex much, and ensure maximum grip. They also last longer under these driving conditions when compared to all-season brands. However, for the average driver, ultra-high performance all-season tires are just fine, especially if you live in a part of the country where the temperature rarely drops below freezing. Swapping out tires seasonally in a state with no snow is not necessary. You can see if you’re driving on seasonal tires by looking at the sidewall. A series of number and letter codes will tell you more about their design and intended function. You can determine if you are driving on seasonal tires by referring to the number and letter codes that appear on the sidewall of each tire. “M + S” indicates that they are all-season mud and snow tires, not summer tires. Summer tires do not have their own code. However, you will see temperature ratings of A through C. An A tire has the highest resistance to heat build-up while a C has the lowest permissible. If you spend time driving on hot roads, like the streets and freeways of Houston, an A tire is your best bet for long-lasting use. Summer tires also perform well on wet roads. The soft, sticky compounds used in summer tires provide grip on damp roads and in low water. If while driving, you notice poor performance in wet conditions, ask a tire professional if your brand of tires comes in a summer line that will help restore grip. Be aware that there is a difference in how a tire handles in low water as opposed to deeper water. Performance in low water is largely a matter of the tire rubber’s ability to grip the road, whereas safe driving in deeper water relies more on the tread pattern. Some summer tires with good compounds have lesser treads for water dispersal, and the opposite is true with all-season tires. Pay attention to how your car behaves in various conditions, and talk to a tire professional to help you find the best tire for your area’s climate. On the unseasonably hot days, the surface of asphalt can be 50 degrees higher than the temperature of the air. To prevent an increase of the already excessive heat your tires are exposed to in the summer, keep your tires inflated to the proper level. Underinflated tires generate more heat because of excessive sidewall flexing. Buy yourself a good air gauge, and use it to check your tires monthly. Proper inflation is the most important part of keeping a tire working as the manufacturer intended, and checking it should be a regular part of your maintenance. Are you concerned that the hot weather is taking a toll on your car or truck? Colony One Auto is here to help. We offer factory scheduled maintenance as well as repair services for every part of your vehicle. Contact us using our online form, and we will respond within 24 hours.